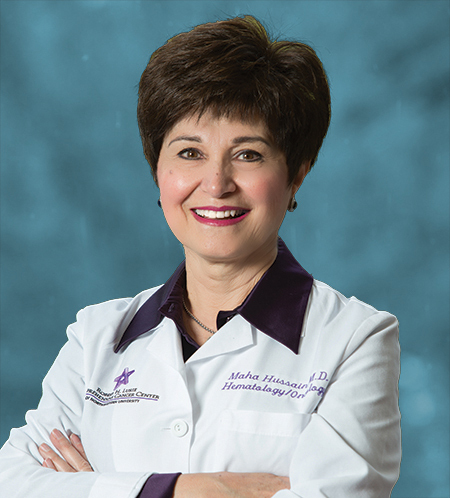 In four recent publications in the Journal of Clinical Oncology (JCO), Maha Hussain, MD, deputy director of the Robert H. Lurie Comprehensive Cancer Center of Northwestern University, detailed new findings related to therapies for advanced prostate cancer, and called for a balanced approach to early detection of the disease. “This represents a good portion of my life’s work, and I think it’s wonderful that these advancements are happening in our lifetime,” said Hussain, also the Genevieve E. Teuton Professor of Medicine in the Division of Hematology and Oncology. Prostate cancer is the most common diagnosed cancer in American men, and the second-most common cause of cancer mortality in this group. Most men diagnosed with the disease do not die from it. However, outcomes are much poorer in patients with an advanced form of the disease called metastatic castration-resistant prostate cancer (mCRPC). In mCRPC, the cancer has spread to other parts of the body, and continues to progress despite treatment with hormone therapy. As such, there has been much interest in developing novel therapies for these patients — one of the areas where Hussain has concentrated much of her research. Hussain and collaborators had previously identified that the DNA repair pathway might serve as a novel treatment target in mCRPC. “Cells that are damaged have internal mechanisms to repair themselves, and cancer cells are very smart — they capitalize on these normal pathways to serve their purpose,” Hussain explained. For example, data had shown that prostate tumors resistant to hormone therapy have increased expression of PARP1, an enzyme with a role in the repair process. Pre-clinical studies had also suggested that targeting the androgen receptor pathway in combination with a PARP1 inhibitor might lead to better results in mCRPC. In a multi-center trial including 148 participants, Hussain and a team of investigators tested whether abiraterone — a hormone therapy that targets the androgen receptor — plus a PARP inhibitor called veliparib would improve response in patients with mCRPC, compared to abiraterone alone. The study, published recently in JCO, found that veliparib did not significantly affect response among patients, although there was a favorable trend. However, the investigators also conducted sequencing analysis of tumor tissue and discovered, for the first time, that patients with alterations in genes involved in DNA repair had a significantly better response, irrespective of their treatment group. “This is a novel observation that opens up the door for more questions,” Hussain said. In fact, the findings prompted the investigators to develop a follow-up multi-center trial, called BRCAAway, to evaluate which combination of therapies might be most effective in patients with mCRPC who have DNA repair defects. Hussain is the principal investigator of the ongoing phase II trial. In two other recent publications in the Journal of Clinical Oncology, Hussain was also the co-author of studies with updated findings from the CHAARTED trial. Initial findings from the seminal CHAARTED trial, published in 2015 in the New England Journal of Medicine and co-authored by Hussain, demonstrated that patients with metastatic hormone-sensitive disease who receive a chemotherapy drug called docetaxel along with androgen-deprivation therapy live significantly longer than those who undergo androgen-deprivation therapy alone. Docetaxel was the first drug shown to improve overall survival in men with metastatic hormone-sensitive prostate cancer. The trial, which included 790 participants, also stratified patients by high-volume and low-volume disease, based on the number and location of lesions. The study found that patients with high-volume disease saw the greatest benefit with docetaxel. In a new study published in January, the CHAARTED investigators provided updated data on overall survival rates of those patients, and took a closer look at the association with tumor volume. The findings confirmed that docetaxel added to androgen-deprivation therapy significantly prolonged survival in patients with high-volume disease, but showed there was no survival benefit for those with low-volume disease. Patients in the updated study had a median follow-up of 53.7 months, compared to 28.9 months in the interim analysis. A second study co-authored by Hussain, and also published in JCO, evaluated the use of prostate-specific antigen (PSA) as a prognostic biomarker for overall survival within the context of CHAARTED. The findings confirm the original observation that Hussain published in JCO in 2006. Levels of PSA, a protein produced by both normal and cancerous cells in the prostate gland, are often elevated in men with prostate cancer. As such, PSA is frequently used as both a screening tool and a biomarker to assess whether men with the disease might be responding to treatment. However, while the usefulness of PSA had been demonstrated in the context of treatment with androgen deprivation therapy (ADT), it was not known whether PSA levels might be similarly prognostic when docetaxel was added to ADT, as in the CHAARTED trial. In the retrospective analysis, the investigators found that for men with metastatic hormone-sensitive prostate cancer undergoing ADT, a PSA blood level of 0.2 ng/mL or less at seven months is in fact prognostic for longer overall survival — regardless of whether they also receive docetaxel or not. Hussain was the senior author of a position paper, published in JCO in February, which explored the debate surrounding early detection of prostate cancer, calling for a balanced approach to screening. Since the early 1990s, the PSA blood test has frequently been used as a tool for early detection of prostate cancer. However, its use for screening in asymptotic men has been controversial. In 2012, given the consequences of treatment and based on what seemed like an over diagnosis of prostate cancer, the U.S. Preventive Services Task Force changed its recommendation against PSA-based screening. “In the meantime, we began seeing a shift in the biology of the cancer and stage at diagnosis. Whether or not that is a function of PSA early detection not being used as much or other factors, it was very concerning,” Hussain said. In the commentary, Hussain and her co-authors call for finding a “sweet spot” in early detection of prostate cancer, with precision-based strategies and shared decision-making among patients and physicians. To learn more about Hussain, her research and her career, read a profile in Northwestern Medicine magazine. The first study, NCI 9012, was supported by grants No. N01-CM-2011-00071C from the National Cancer Institute (NCI), SU2C-AACR-DT0712 from Stand Up to Cancer and American Association for Cancer Research, P50CA186786 from NCI, PC080189 from the U.S. Department of Defense, and the Prostate Cancer Foundation. The second study, on updated survival in the CHAARTED trial, was supported in part by a grant from the National Cancer Institute, National Institutes of Health, Department of Health and Human Services, and by grants CA180820, CA180794, CA180795, CA180802, CA180799, CA180790, CA180853, CA189829, CA180801, CA180888, CA31946, and CA180821 from the Public Health Service. Sanofi provided the docetaxel and a grant to ECOG-ACRIN. The retrospective analysis was supported by the National Cancer Institute Cancer Therapy Evaluation Program and the Eastern Cooperative Oncology Group (ECOG)–American College of Radiology Imaging Network (ACRIN). The study was coordinated by the ECOG-ACRIN Cancer Research Group (Peter J. O’Dwyer, MD, and Mitchell D. Schnall, MD, PhD, group co-chairs) and supported by the National Cancer Institute of the National Institutes of Health under the following grant numbers: CA180820, CA180794, CA180795, CA180790, CA180802, CA180821, CA180833, CA180847, CA180853, CA180867, CA180888, CA180801, and CA189829. Sanofi provided docetaxel for early use.